The ‘Fukrey Returns’ team Pulkit Samrat, Varun Sharma, Manjot Singh and Ali Fazal will open a restaurant named ‘Lukkhas’ for the college students in Mumbai. 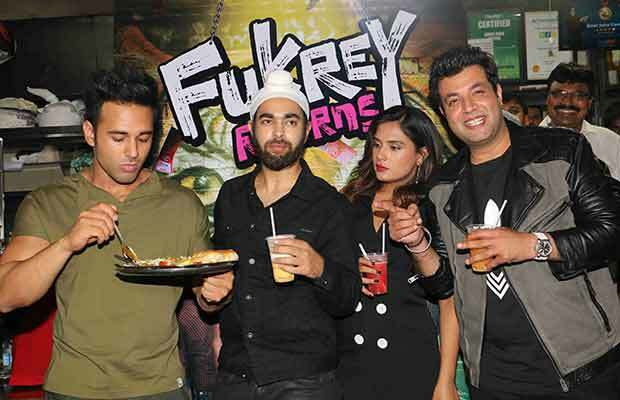 The Fukra gang who made the word Fukrey synonyms with every college group is taking their Fukreypanti to an all new level as they are set to open an eatery in Mumbai that would be a go-to place for every college group. The Fukrey Returns team noticed, people often stand at the stalls even in the scorching heat to grab a bite of their favourite delicacies, in order to facilitate the college goers, the team came up with the idea of ‘Lukkhas’. The restaurant to be situated in places known to be hang-out places for the college goers will serve a varied range of street food with a fusion of Jugaad, making it the go-to place for college gangs. Previous articleFukrey Returns: The Fukra’s Will Now Forecast The Delhi’s Weather! Next articleWatch: Kareena Kapoor Khan’s Shocking Reaction When Asked About Deepika Padukone’s Padmavati!